CES 2018: Razer debuts world's first battery-less wireless gaming mouse, the Razer Mamba HyperFlux. Razer today announced its new Razer HyperFlux Wireless Power Technology - allowing for seamless uninterrupted power transfer from a HyperFlux-enabled mouse mat to its companion mouse. 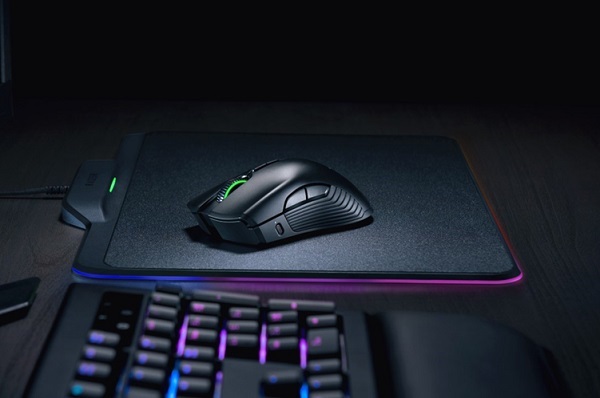 The Razer Mamba HyperFlux mouse and the Razer Firefly HyperFlux mouse mat are Razer's first products to be equipped with this revolutionary technology. Unlike other attempts to create wireless power for a mouse, the new Razer HyperFlux technology allows the mouse mat to create a magnetic field that efficiently transfers power directly to its companion mouse instead of charging a heavy battery. The technology is the world's first to provide power directly to the mouse and eliminates the need for a battery. The result is an ultra-lightweight wireless gaming mouse with a weight that's traditionally only achieved by wired mice. The Razer Mamba HyperFlux mouse is also equipped with Razer's proprietary Adaptive Frequency Technology (AFT) for superior signal strength. This ensures industry-leading wireless signal stability between the mouse and computer by adaptively scanning and switching to the strongest signal within the 2.4 GHz frequency band. Combined with a 16,000 dots-per-inch (DPI) 5G optical sensor, the Razer Mamba HyperFlux is a top-tier wireless gaming mouse with swift and precise movements, that never needs charging. The Razer Firefly HyperFlux is the latest evolution in Razer's award-winning RGB mouse mat line. It features a dual-sided hard and cloth surface that allows for flexible playstyles. Gamers can opt to use the hard side for speedy mouse actions or the cloth side for control and precision aiming. When connected, the mat supplies indefinite power to the mouse, allowing for smooth, unceasing gameplay. Powered by Razer Chroma lighting technology, both devices have access to 16.8 million color options and are capable of unique customizable lighting profiles and in-game effects.